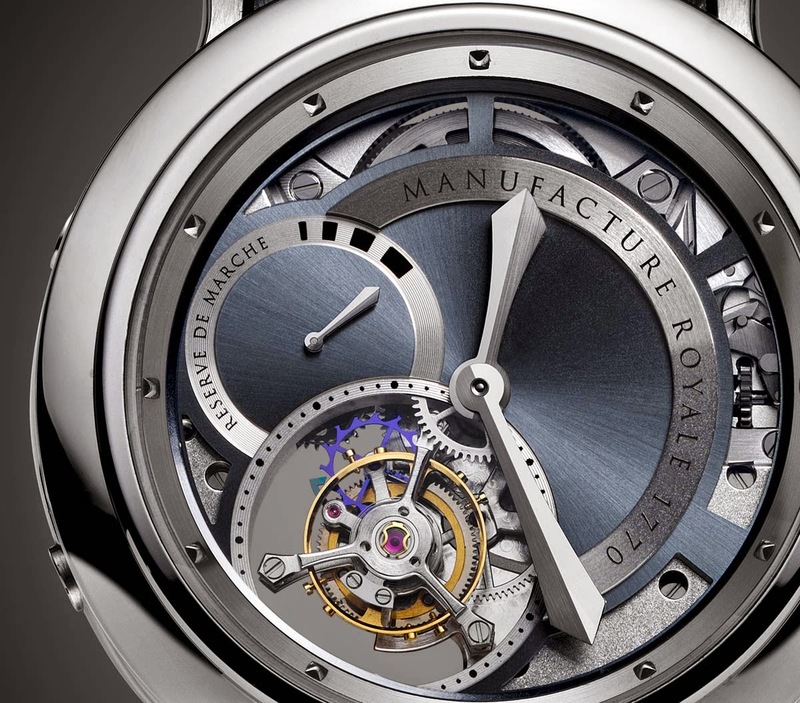 Manufacture Royale was founded in 2010 to bring back to life the Manufacture Royale brand, whose creation dates back to 1770 when the famous French philosopher Voltaire, after exiling to Geneva, set up his own haute horlogerie workshops in Ferney to create exclusive timepieces for the European royalty. Several thousand timepieces were produced in the Manufacture's workshops, some with the collaboration of renowned watchmakers like Jean-Antoine Lépine. The modern Manufacture Royale design timepieces which combine traditional watchmaking with the latest industrial technologies and manufacture them in-house in the workshops in Vallorbe. 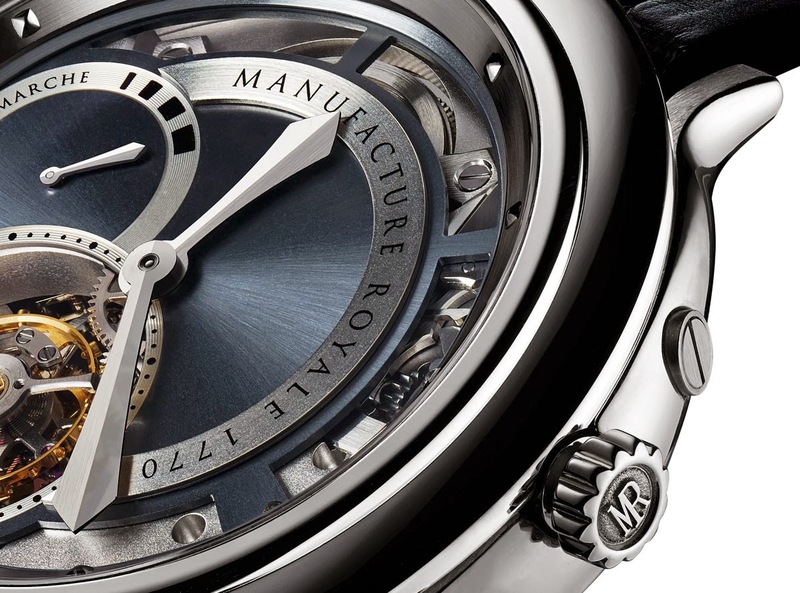 The latest creation is the 1770 Openworked Steel whose 43 mm round case, made of stainless steel with polished, straight-grained and satin finishes, was imagined by renowned watch designer Eric Giroud. The lugs are formed by two brancards secured by functional, visible screws to the main body of the case. The transparent case back reveals the beautifully finished MR03 hand-wound movement which beats at 21,600 vibrations per hour and offers a power reserve of 108 hours or four and a half days. The plate and bridges are hand-chamfered, the mainplate is decorated with Côtes de Genève and gold engravings. On the front side the 1770 offers a fascinating openwork slate-coloured dial structured on various levels. The flying tourbillon, which makes one revolution in 60 seconds, is positioned asymmetrically at 7 o'clock and features a pallet fork and escape wheel in silicon for better performances thanks to the properties of silicon and, in particular, its resistance to variations in temperature and to magnetic fields. 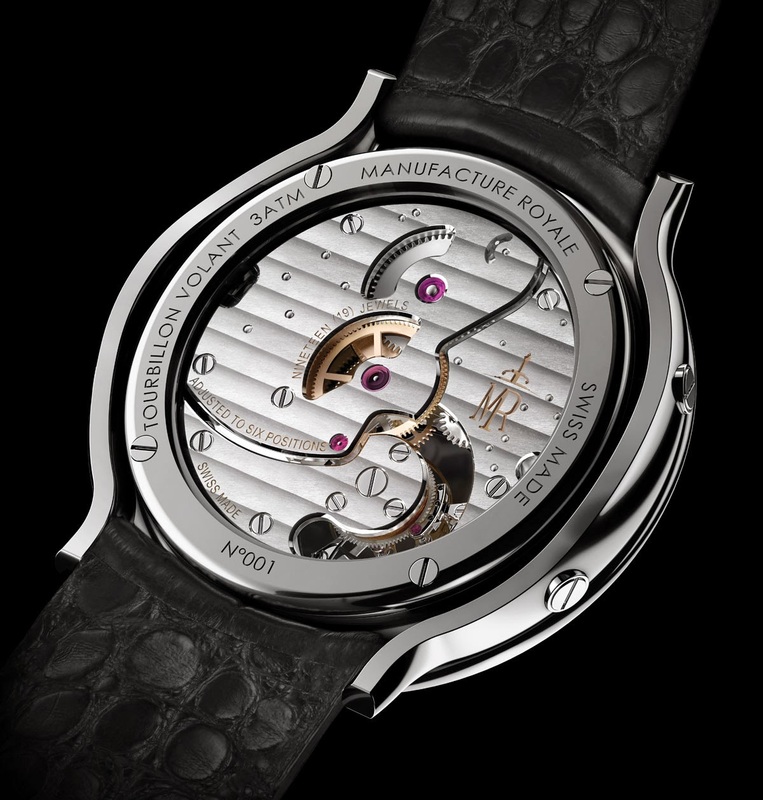 In addition to hours and minutes, the 1770 incorporates a power-reserve indicator. A final characterizing touch, the large sword-shaped hands are half satin-finished and half polished for easier legibility. 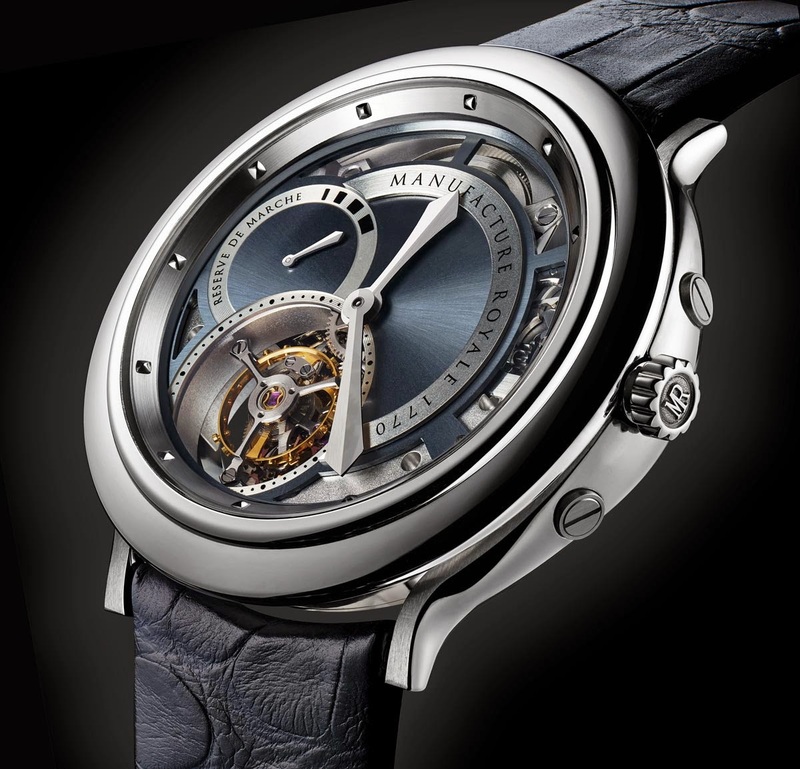 The Manufacture Royale 1770 Openworked Steel (ref. 177043.01P.S) has a retail price of Swiss Francs 48,000. Manufacture Royale 1770 Openworked Steel. The modern Manufacture Royale design timepieces which combine traditional watchmaking with the latest industrial technologies and manufacture them in-house in the workshops in Vallorbe. The latest creation is the 1770 Openworked Steel whose 43 mm steel case was imagined by renowned watch designer Eric Giroud. 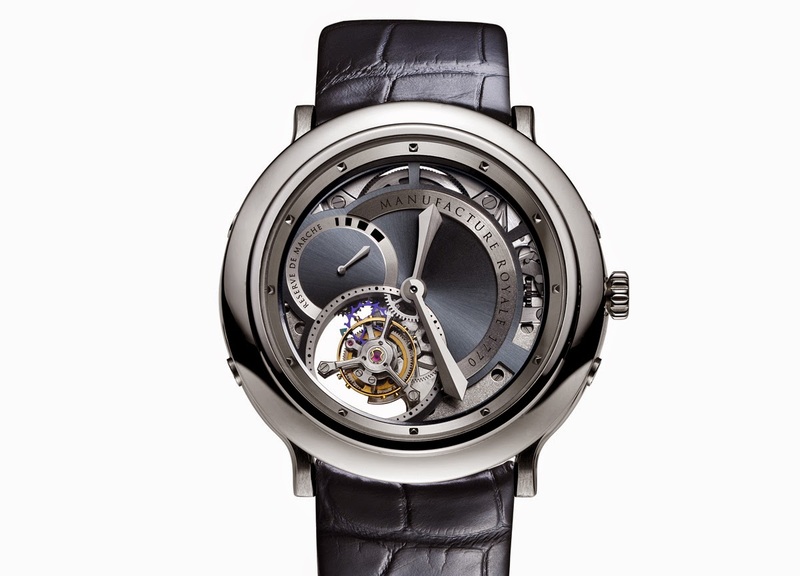 The Manufacture Royale 1770 Openworked Steel (ref. 177043.01P.S) has a retail price of Swiss Francs 48,000.